When it comes to dehydration, there are few better options when it comes to preserving in-season produce. 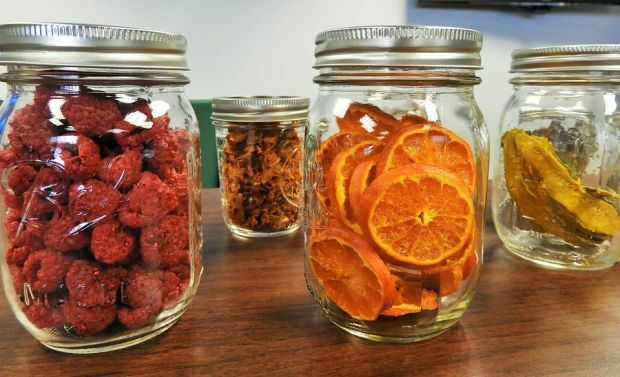 Dehydrated foods, if properly stored, last for months. If dehydrated food is stored properly, some homesteaders even claim that dehydrated food can last up to a year! Unlike canned and frozen foods, the equipment for which takes up quite a bit of space, dehydrated foods can be stacked and stored easily. Little equipment is required to successfully dehydrate your foods, and even beginners can learn to do it with very few start-up resources. It is a great option for a prepper or homesteader looking to maximize storage space and build enough of a food store to last throughout a long winter season. Drying food using a dehydrator removes enough moisture from foods so that bacteria, yeast, and mold cannot grow. It should be noted that fruits, vegetables, and herbs (in otherwise, anything plant based) are the only products that should be dehydrated according to these methods. Meats can also be dehydrated, but require additional time and know-how, as well as the addition of several ingredients. There are five methods that you can use when dehydrating your produce: through the use of a dehydrator, in an oven, in the sun, in the microwave, or in fresh air. Essentially, any of these methods will work so long as you have low humidity and a source of low heat (around 130 degrees Fahrenheit). You also need ample air circulation to help remove moisture from the food. The steps for each process are outlined below. Fruits, vegetables, and herbs can essentially be dehydrated in exactly the same way. It should be noted that, due to the low acidity of most vegetables, these should never be dehydrated using the sun or air methods. Using a dehydrator is best for most types of vegetables as their low acidity can affect food safety. You will also need one of the following: a hot, dry location within your home, an oven, a microwave, or a dehydration machine. Peel your fruits and vegetables (optional). Generally, skin will become tough during the dehydration process, so removing it helps the overall flavor of your food. Sliced, peeled pieces will dry more quickly than those than haven’t been peeled as well, because skin reduces surface area and does not allow moisture to escape. Pretreat your foods. Some foods dry better when pretreated, as this process reduces oxidation. Many foods achieve a better color and nutrient content when pretreated. This also increased shelf life. Additionally, any fruit that has been left unpeeled or uncovered must be treated to destroy bacteria or insect larvae. To pretreat fruits, place them in a solution of a half teaspoon of citric acid with two cups of water (or equal parts lemon juice and water). Leave them in there for ten minutes before beginning the dehydration process. To pretreat vegetables, blanch three to five minutes in boiling water. Blanching is a good idea for vegetables such as broccoli, cauliflower, potatoes, and corn. Onions, garlic, and herbs do not need to be blanched. To pretreat fruits and vegetables for which you leave the skin intact (such as blueberries or cranberries), prepare boiling water. Dip each piece in boiling water to crack the skins. Do not leave the fruit submerged or you will cook it. Chill and then dehydrate. 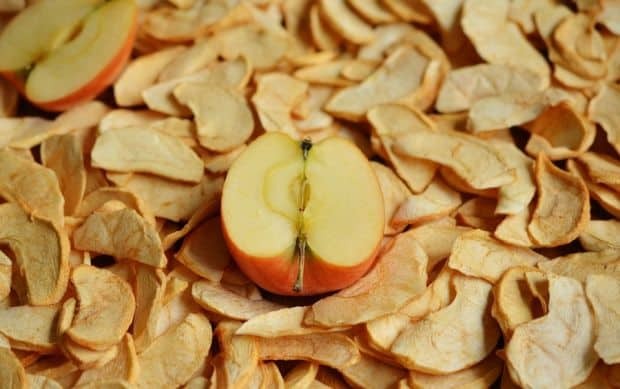 A dehydrator typically creates the best quality product compared to other methods of drying. Although most machines are inexpensive, their purchase can be a barrier for many beginning homesteaders. Therefore, other options are available that maximize the resources you already have. Dehydrators consist of an electric element that produces heat, along with a fan and vent to circulate air. These machines dry food quickly, uniformly, and safely. 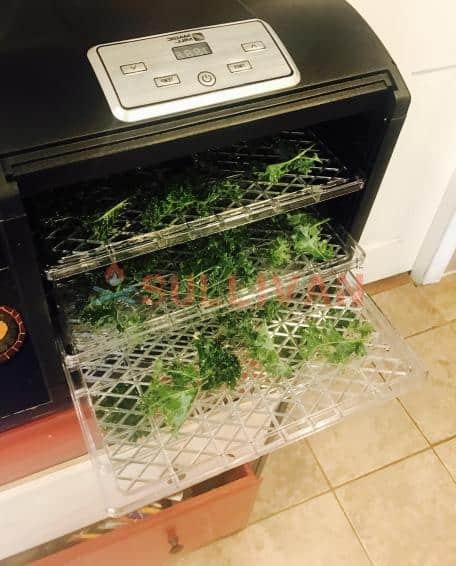 Because they consist of several racks stacked on top of each other and are entirely enclosed, you don’t have to worry about pests nibbling on your fruits and veggies before they’re done drying. Follow The First Two Steps (peeling and pretreating). Slice fruits and vegetables thinly. Place pieces on drying racks of the dehydrator, without allowing them to overlap or touch. Return trays to the dehydrator. Dehydrate at a temperature of 140 degrees Fahrenheit for anywhere between five to thirty hours. The length of dehydration will depend largely on the type of food you are drying. Use judgment and follow the guidelines below to ensure the food is entirely dry. Test your food periodically to see if it has cured properly. Dehydration is complete when fruit is pliable and no beads of moisture appear. 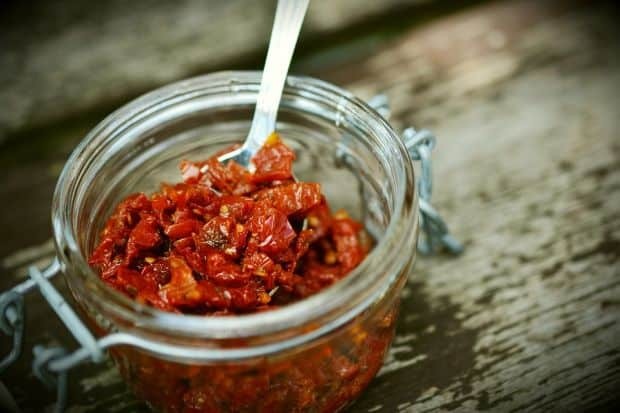 Perfectly dehydrated vegetables will be brittle and crunchy. Do not move or pack food until it is completely dry. Dried food can be packed into an airtight container for several days, then stored in a dark location. Make sure food is packed tightly–this will allow any remaining moisture to distribute evenly. Air drying works well for low-maintenance produce such as herbs, hot peppers, and even mushrooms. Air drying can be difficult because it requires a hot, airy location that is often not available in most households. However, it is a free process and requires no extra equipment. Air drying differs slightly from sun drying, as it must take place indoors. This can be done regardless of where you live, but you must still moderate the conditions. Air-drying can take place in a ventilated attic, spare room, or screened-in area such as a greenhouse. Follow The First Two Steps (peeling and preparing). Bind fruits and vegetables in a tight bundle (using a stem) or place them evenly next to each other. It’s okay if they touch. Place or hang your foods in an area with good ventilation and high heat. For example, you can place individual pieces on a milk crate or mesh window screen, or hang in a sunny window. Allow the pieces to dry for two to six days. Follow the same steps as you would with a dehydration machine to ensure that your food is fully dehydrated. About 20% moisture will remain in air-dried fruits and vegetables, so you may want to consume it more quickly than you would food dehydrated with a machine. Sun-drying is a method that requires consistent exposure to direct sunlight during the day. This one is tricky to do unless you live in a hot, arid climate, such as in the American Southwest. Most locales will not receive a low enough relative humidity to sun-dry fruits and vegetables. This option only takes about three to four days, but if humidity is high, the food will mold before it gets a chance to dry. This makes it a futile effort for many. 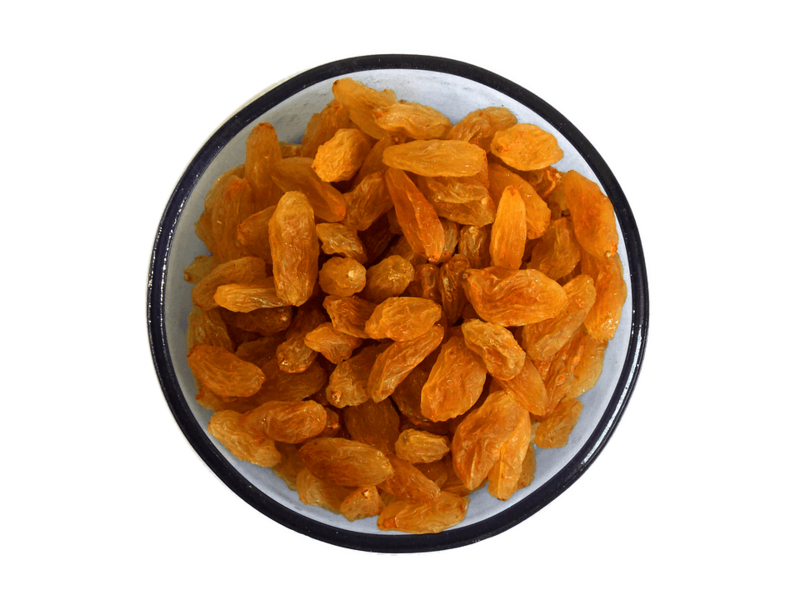 However, many popular foods (such as raisins) are typically sun-dried. Bind fruits and vegetables in a tight bundle (using a stem) or place them evenly next to each other in an outside location. Spread foods out on paper-lined trays covered with cheesecloth. Allow the pieces to dry for two to four days. Follow the same steps as you would with a dehydration machine to ensure full dehydration. It’s important that you turn the pieces every day so that they receive equal sun and heat exposure, as well as aeration. Make sure your pieces are covered. Since this process is conducted outside, your food is more likely to be nibbled by pests. Microwave drying works best for small quantities of foods. Typically, only herbs and leaf vegetables can be microwaved-dried. Others will generally wilt or cook through entirely before they are dehydrated. Food that has been microwave-dried generally just tastes overcooked instead of dehydrated, and the jury is still out when it comes to the safety and long-term preservation of food using a microwave. Place no more than five small pieces of food between two paper towels. After three minutes, remove the plants and allow them to cool. If they are dry and brittle, they are done. If not, continue to microwave for intervals of thirty seconds each until they are finished. Follow the same steps as you would with a dehydration machine to pack and store your food. Using an oven is another option. Most households have an oven, so this is a highly convenient and inexpensive option. However, it takes three times longer to dry food in an oven than in a dehydrator, as it is not as efficient. Ovens also do not have built-in fans, so it’s necessary to add your own for necessary air circulation. You must also have an oven that can be set as low as 140 degrees to avoid cooking your food instead of drying it. Place your foods on a clean cookie sheet or wire rack. Do not allow the items to touch or overlap each other. Heat your oven to 130 degrees Fahrenheit. Allow your food to dehydrate for several hours. While dehydrating, leave the oven door propped open about two to three inches. Additionally, place a large fan near the outside of the oven to ensure that food receives proper air circulation. It is also advisable to monitor the drying temperature by using a thermometer, especially if your oven is finicky or sensitive to operating at low temperatures. You want to make sure you aren’t overcooking your food. Food will be dehydrated after about six hours if using a wire rack, or eight hours if using a cookie sheet (due to the difference in ventilation). Follow the same steps as you would with a dehydration machine to determine if your food is fully dehydrated, and to store. Drying your fresh fruits, vegetables, and herbs is a process that allows you to enjoy the bounty of your garden throughout the year. 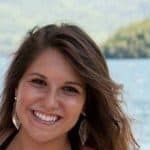 Even if you have limited start-up funds or time, dehydration is an enjoyable hobby that will allow you to store and stockpile food to your heart’s content.